I doubt the four creators of Spinal Tap (Reiner, Guest, McKean, Shearer) would have predicted the staying power of this little movie. Yet, 25 years later, the comedic force of Tap continues unabated. Evidence of the breadth of comedic material available from this concept includes, numerous reunifications tours, music albums which were released years after the film, occasional cameo appearances at rock festivals, award shows etc. “This is Spinal Tap” was remarkable for its ability to laser in on a very specific subject – the career trajectory of many 60's/70's bands as well as the documentary form itself, and specifically, the 'rock documentary'. Stylistically the film uses Led Zeppelin’s “The Song Remains the Same” as their template. Perhaps even positing, in an extreme situation, what could have happened to Zeppelin if they had stuck around through the 80’s – a washed-up sad parody of themselves, unable to see the forest for the trees. Though Reiner serves as director, the films made by Guest later in the 90’s suggest the comic and visual style in “Spinal Tap” is more collaborative than what his credit would suggest. You know the story… with an invisible improvised/naturalistic style Guest, McKean and Shearer inhabit the skins of Nigel Tufnel (lead guitarist), David St. Hubbins (lead singer) and Derek Smalls (bassist), the washed-up 70’s hard rock band Spinal Tap. Using the language of a traditional documentary – stock footage, interviews and fly-on-the-wall cinema verite, we watch as the band lose their dignity as they attempt to release their latest album on a record label that no longer wants them to an audience that is virtually non-existant. In a series of wonderfully deadpan comic situations we watch the naïve and portentous bandmates fail miserably at everything they do - from their disastrous album signing, to their Stonehenge stage production snafu to their much-argued album cover which ends up being ‘all black’. As things go downhill, the strain and pressure of their increasing self-awareness causes the band to split up thus threatening to erase their 30 year friendship. The backstory created for the band, told to us in interviews filled with wonderful comic subtext, references the minute details of rock lore such as the Beatles' beginnings in the ‘skiffle’ movement, Led Zeppelin’s first incarnation as a pre-psychedelic folk band the New Yardbirds, and the devolving artistic creativity of many other bands toward hideous sexism and role-playing heavy metal. Rob Reiner (aka Marti DiBergi) as documentarian does not come out unscathed either. His pretentious and stagey first person introduction to camera is hilarious, poking fun at manufactured television documentary specials. DiBergi's naval hat, his ‘director’s beard’ and his unncessary reaction shots during the interviews suggest the powerful but pompous ego stroke of Hollywood filmmakers. “Spinal Tap” wasn’t the first mock documentary – Albert Brooks and Woody Allen laid some of that groundwork prior to ‘Tap’ – but the film sustains (like Nigel’s Les Paul guitar) because of its wonderful attention to character. It’s very clever. As we marvel in the deadpan absurdities of the behaviour of these idiotic characters, without realizing it, Reiner’s crafting a surprisingly emotional and profound study of friendship. More than just a story of has-been rockers, by the time Nigel and David reconnect their band "This is Spinal Tap” reveals itself as a story of lifelong friendship which breaks apart and then is mended with forgiveness. 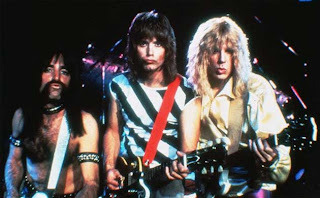 Spinal Tap's continued cultural relevance is remarkable - starting as a TV sketch in 1979, expanded into a full feature in 1984, which then grew into it's own alternate world of characters and new stories which evolved over the next 25 years. As evidence of the comic legs of the concept, the Blu-Ray and DVD even features a full length, in-character audio commentary of the band commenting on their film, which is just as funny as the actual movie.